About a year and a half ago, home canners began to learn that the flat metal lids they use to seal their jars, like the metal cans that so much store-bought food comes in, were lined with a plastic coating containing bisphenol A (BPA), a chemical of questionable safety. Since then we’ve learned to limit our exposure to this endocrine disrupter by switching from polycarbonate to stainless-steel water bottles for grownups and from hard to soft plastic milk bottles for babies, and eleven U.S. states and even China have joined Europe and Canada in banning BPA from baby bottles. Those of us beyond babyhood, however, tend to take in BPA mainly through canned food. The linings of most cans haven’t changed.1 Nor have the linings of jar lids, for commercial use or for home canning. Scientists and governments disagree about the magnitude of this problem, and even whether it’s a problem at all. Canada identifies BPA as a toxin; the European Food Safety Authority (EFSA) believes BPA safe to use in can and lid linings; and the U.S. Food and Drug Administration hopes that industry will find alternatives to BPA without governmental intervention.2 Because studies of the dangers of BPA have produced conflicting results, in November 2010 the United Nations Food and Agriculture Organization (FAO) and the World Health Organization (WHO) held a joint meeting of international experts to review the data on the health risks of BPA. In 2011 the background papers presented at that meeting were edited and posted to the WHO website along with a summary report. The conclusions were that BPA probably doesn’t cause cancer, induce genetic mutations, or, generally, accumulate in the body, but that it may possibly have harmful effects on metabolism, children’s (especially girls’) behavior, and sexual development and reproduction. More studies are needed, the scientists said. And more studies are under way. In the meantime, many home canners wonder why Ball, Kerr, and their Canadian counterpart, Bernardin, don’t play it safe by changing the coatings of their jar lids immediately. One reason is that these three formerly independent companies are all brands now belonging to Jarden Corporation, which also happens to own FoodSaver, Crock-Pot, Mr. Coffee, Oster, Rival, Seal-a-Meal, and Sunbeam, to name a few of the businesses this conglomerate has devoured. Jarden clearly has its corporate hands full, and no true competitors to worry about. Besides, the BPA-containing epoxy resin coatings, made by corporations such as PPG and Valspar, have for decades done an excellent job of keeping metal from leaching into canned food. Like their fellows in food processing, the folks at Jarden may feel that BPA-containing coatings are still their best choice (see Update, below). I honestly haven’t fretted about BPA in my jar lids. Food stored in an upright mason jar, after all, needs never touch the lid. 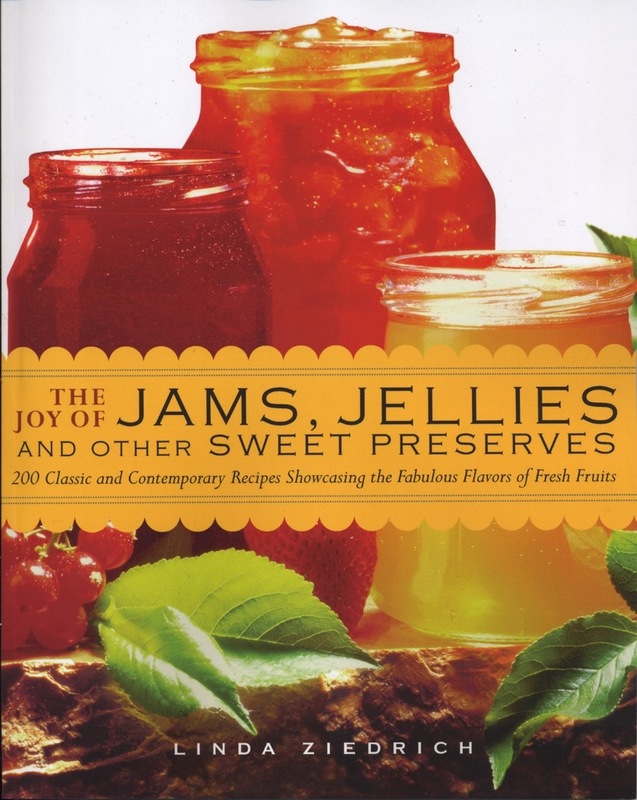 Even during processing, jellies and thick jams tend to maintain most of their headspace. But other home-canned products, such as whole or halved tomatoes, do boil up and touch the lid while the jar is processed in a boiling-water bath or pressure canner. Is it possible to minimize the migration of BPA into home-canned food during processing? No one has performed experiments to find out, but studies on tinned foods offer some hints. According to one of the FAO/WHO reports, more BPA migrates from can linings into food when the food is processed at pressure-canner temperatures than when it’s processed at a lower temperature for a suitably longer period. Processing jars of tomatoes in a boiling-water bath, therefore, may result in less BPA contamination than pressure-canning them. Low-temperature pasteurization, recommended by the USDA for keeping cucumber pickles firm, results in even less BPA contamination in tinned foods than does processing the foods in boiling water. 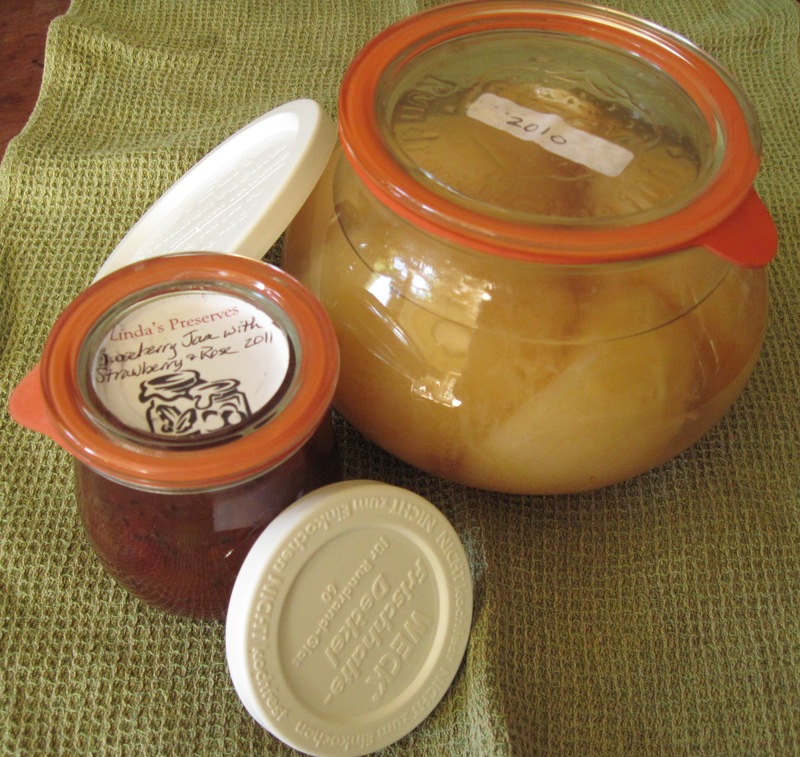 In the case of home canning, using the low-temperature method might result in no contamination, since the liquid in the jar would never boil. Salt tends to increase the migration of BPA into tinned food, according to the report, so unacifidified vegetables such as beets and beans, which you must pressure-can to prevent botulism, might take up less BPA if you left out salt. Oil has the same effect as salt, the report says, so you might prefer to can cooked tuna with water rather than oil. Acids also increase migration of BPA. Most of this migration happens during processing, but some can occur during storage if the food is in contact with the BPA-containing coating. The coating can’t touch the food as long as the jar stays upright, but some home canners who send their products to friends and relatives worry that even jellies and well-gelled jams may end up tainted by BPA if the parcel is flipped during shipment. This fear is legitimate. In 2010, Popular Mechanics sent boxes loaded with movement and impact sensors around the country via the U.S. Postal Service (USPS), the United Parcel Service, and Federal Express. The packages got turned upside-down repeatedly during every trip with each company. (Although the USPS dropped the packages the least, it flipped them the most—on average, twelve and a half times per trip!) The package labeled “FRAGILE” and “THIS SIDE UP,” in fact, got flipped the most. Some home canners have tried to avoid these concerns by hunting down BPA-free mason-jar lids, and several have asked for my help in searching out and testing them. One reader of this blog recommended Leifheit lids, from Germany. These lids are both BPA-free and “bulletproof,” she told me. Before I ordered some, though, I wanted to confirm that they were BPA-free. This should have been easy; Leifheit has a U.S. division with an excellent website. But my emails and phone calls to the company were never returned, and others inquiring about BPA have reported the same experience. One blogger got through to a representative who admitted that the Leifheit lid linings have “negligible traces of BPA.” Perhaps as many traces as Jarden’s lids have, albeit at a much higher price? Nobody seems to know. One European mason-jar manufacturer makes truly BPA-free metal lids, according to Cathleen O’Keefe of the Massachusetts chapter of the Northeast Organic Farming Association (NOFA). Bormiolo Rocco, an Italian producer of fine glass, sells these mason jars and one-piece caps under the name Quattro Stagioni. Cathleen, who places bulk orders on behalf of NOFA members and anyone else who wants the caps, sold me some in both regular and wide-mouth sizes ($.80 and $1.05, respectively, for a packet of two, plus a little for shipping; Ball lids, when sold with screw bands, cost almost as much). The Quattro Stagioni caps are easy to use: You just rinse them in hot water, fill the jars as usual, and screw on the caps. If I’m translating the Italian instructions correctly, you’re supposed to leave the jars in the kettle of hot water until they have cooled, but I take them out as soon as the boiling period is up, in accordance with USDA recommendations. You can tell the jar is sealed in the same way you can with a Ball or Kerr lid: The vacuum pulls the center of the lid down firm. Nicest of all, you can open the lid by unscrewing it rather than prying it off. Quattro Stagioni caps are not intended for pressure canning. An American-made, BPA-free alternative to Ball and Kerr lids is a product called Tattler. The Tattler lid is made of solid plastic, a substance called acetal copolymer. This plastic contains no BPA, and it’s approved by the USDA and FDA for contact with food, including meat, provided the food doesn’t contain 15 percent or more alcohol. The plastic lids are guaranteed to last a lifetime, and the company says that in their thirty-five years or so in production no one has ever asked for a replacement. The lids are especially recommended for use with acid food, since acid doesn’t degrade them as it does metal. The lids can be used in pressure canners as well as boiling-water canners. To make a Tattler lid stick you need a rubber ring, which you place on the jar rim under the plastic lid, and a standard metal band to screw over the plastic lid. The rubber ring is reusable several times, until it becomes stretched, cracked, or cut. The company recommends reversing each ring with each use to prolong its usefulness. You can buy the rubber rings with the lids or separately; the metal screw bands you must get elsewhere. The recommended procedure for using Tattler lids and rubbers is a little different from that recommended for Ball and Kerr two-piece caps. After scalding the Tattler lid and ring and placing them on the jar top, you screw on the metal band all the way and then turn it back ¼ inch; this allows the jar to vent during processing. After processing, you tighten the metal band as soon as you take the jar out of the canner (use two heavy towels or potholders to avoid burning yourself). When the jar has cooled, remove the metal band. You know the jar is sealed if the lid stays on. To remove the lid, gently insert a table knife between the rubber and the jar. An Extension food safety specialist at the University of Georgia, Elizabeth Andress recommends allowing 1 inch headspace when canning with Tattler lids, but I can’t imagine why. I suspect this would lead to oxidation—that is, darkening of the food at the top of the jar. When I’ve used Tattler lids, I’ve stuck with the standard headspace measures of ¼ inch for jams and jellies and ½ inch for pickles. Tattler lids and rings are probably too expensive ($20.95 for three dozen narrow-mouth lids and rings and $23.95 for a wide-mouth set, from the company website) if you are selling or giving away your preserved foods and aren’t sure the recipients will return everything—jar, lid, ring, and band–undamaged. But the lids and rings are very nice for home use, especially with ungelled acid foods such as pickles, relishes, and tomatoes. And Tattler products may be affordable if you can buy them from a local store instead of having to pay for shipping. Maybe you’re nervous about putting any plastic in contact with your food. Another option is glass—glass jars with glass tops. I’ve long kept some of the German-made Weck jars, which are now widely available at U.S. cookware stores as well as via the Web. These jars come with rubber rings much like the Tattler rings, and stainless-steel metal clamps that hold down the glass lids during processing. The rings shouldn’t be reused, according to the manufacturer, but you may find that like Tattler rings they last well through multiple uses. You know a ring is good when you take the clamps off the cooled jar and the glass lid stays on. For storing opened jars in the refrigerator, Weck sells plastic caps to fit. When the rubber rings for your Weck jars have worn out, of course, you must find new ones, and until recently this was difficult to do in theUnited States; my Weck jars sat unused for years for this reason. Now, however, the rings are available inexpensively at Weck’s U.S. website. Some Weck jars come in whimsical shapes; I have “deco” liter jars that are nearly round. USDA processing times are based on jars shaped more or less like Ball and Kerr jars. If this concerns you, either stick with the more standard shapes or increase your processing times a bit. The only disadvantage I find with Weck jars, besides the prices (for example, six half-liter cylindrical jars cost $18.25, plus shipping, on the Weck website), is the minor difficulty of getting the metal clamps on. I often chip the lids when doing this, though the slight chipping doesn’t damage their integrity. Should the health risks of BPA induce you to try one or more of these alternative canning products? Perhaps so, if you’re worried, especially if you’re feeding your home-canned goods to young children or shipping them around the country. But first you might try more effective ways of reducing your BPA exposure. Besides shunning polycarbonate bottles, avoid eating foods from metal cans, particularly meats, soups, and vegetables, unless the cans are labeled as BPA-free. Don’t heat food in plastic containers, and wash your hands after handling thermal paper (slick cash-register receipts, for example). As long as you’re using conventional jar lids, you may be able to reduce your exposure to BPA by leaving the salt out of pressure-canned foods, processing tomatoes in a boiling-water bath, and using low-temperature pasteurization for pickles. Most important, store your jars upright. Update, May 24, 2013: According to Jarden Home Brands, Ball and Kerr lids produced since last fall have no BPA. Starting this summer, boxes of the lids will be labeled “BPA-free.” Until then, you can find out whether lids in your cupboard or on the store shelf have BPA or not by checking this article at Diary of a Tomato. 1. For a list of exceptions, see this 2010 article by A. K. Streeter. 2. The EFSA and the U.S. Environmental Protection Agency agree that 50 micrograms per kilo of body weight is a tolerable daily intake of BPA. Urine tests have indicated that the average American takes in one-thousandth of this amount. As reported in this 2009 article from Consumer Reports, however, some scientists believe that the 50-microgram limit is much too high. This entry was posted in Preserving science and tagged Ball, bisphenol-A, BPA, canning, EFSA, EPA, FAO, jar lids, Jarden, Kerr, Leifheit, preserving, Quattro Stagioni, Tattler, Weck, WHO. Bookmark the permalink. thanks for your thoroughness on ths subject. I use mostly weck and vintage wire bail balls now. I started experimenting with tattler lids last summer and I do like them. the only problem is many of mine arrived with a nick on one side which looks like a manufacturing defect. I have yet to deal with their customer service so we’ll ell see how that goes. tigress, where do you get the vintage wire bail Balls? I searched around on eBay. the only thing is you have to be very clear with the seller that you are using them for canning and they cannot have any nicks no matter how small, or rust on the wires. I’ve gotten a few duds but for the most part I’ve built up quite a nice collection. garage or tag sales if you have the gumption can be a good source too, and when friends and neighbors see I am using them for canning – they offer to give theirs to me! I use the smallest weck rubber rings for them. I’ve never had a sealing problem, one here or there but no more than the commonly used screw caps. I really love using the vintage jars, they are sturdy and beautiful, about the only problem is you can’t stack them. Thanks so much for this information, tigress. I have some of these old jars myself, but I’ve used them only for dry storage. My only problem with them is that I tend to drop and break the lids. Great post Linda! I live in Italy at the moment and all the home canning I do has been with the Rocco brand Quattro Stagioni. When we first moved here I was dying to can tomatoes and the only jars I could find locally were industrial metal lidded jars (the type you would find on your grocery shelf) and the Quattro Stagioni jars. Thank you for that information, Dominique. I haven’t seen the Quattro Stagioni jars in the flesh, but there are good photos of them at http://myhome.bormioliroccocasa.com/quattro-stagioni/en/collections/quattro-stagioni-vasi.html. I’ve found Quattro Stagioni (“Four Seasons”) at Sur La Table, both in their brick-and-mortar stores and on their website. The jars are very pretty indeed! I used them to give gifts of my candied jalapenos for Christmas last year and everyone commented on the quality of the jars. I’ve also seen them on Amazon.com. They were actually my first foray into home canning and I’ve been very pleased with the results. Thanks for this information, Valerie. I’d love to know more about your candied jalapenos! YAY! Tattler is a Michigan made product. I’m not one to worry about BPA. However I do like Tattler because I can reuse the lids and gaskets, although I find the gaskets tend to stretch out and not fit as well afer the first use. I use their product for jars that I am not giving away. I have never done the recommended tightening/loosening regime to no ill effect. Thanks for such a thorough and informative article. I’ve been trying to come up a best practice for canning and Weck may be the way to go – but I’ll probably use up my stash of ball lids first. The Quattro Stagioni lids don’t allow venting during processing and they unscrew. You have to screw them back after taking the jars out a good 1/4 of a turn (not the 1/4 of an inch advised for the Tattler, but a good real 90° angle) or they won’t seal at all. Extremely informative, thank you for this article! I was also interested to read about the different types of jars from outside the US. I bought some of the Tattler lids already but haven’t gotten a chance to use them. I still have some regular metal lids on hand for the jars I give away, but I’ll be more careful in handling them now. I hope Ball/Kerr someday find a BPA free alternative lining. In fact I think I’ll write to ask them about it. Thanks so much for your post. I appreciate the thoroughness and alternatives to the traditional snap lid. I can’t seem to find Weck in my part of Canada, so I’ll keep my eyes open for the Tattler. Everybody, Jane is a painter with dozens of lovely preserving recipes, well illustrated with her photographs, on her blog at http://chocolat-earthcookie.blogspot.com/. Now I guess I get to award more writers the Liebster award. Stay tuned . . . Excellent discussion with different views!! Thanks. Thank you for the very comprehensive review of canning options, much appreciated! Thank you for sharing all your research and a very readable synopsis. I don’t worry too much about BPA yet. We don’t have children in the house and don’t use water bottles in any case. Fortunately, we live here in the Portland metro area and can take advantage of the nearly-year-round farmers markets and can eat fresh food a large part of the year. I’m hoping they don’t find an increased amount of BPA in pickled foods though. Pickling is half the reason I start canning in the first place! Thank you, this is the best overview of this topic I have yet read. My international readers are always talking about their Wecks, it’s nice to see all the options in one great article. I’m willing to theorize that a comprehensive history of American food consumption could be told using health scares related to a single ingredient in foods or food containers. Much easier to fret about and “take action” against than, say, a crumbling health system. Thank you so much for a balanced approach on 2011’s demon of the year. Love this! Jennifer, thanks for making that very good point. Wow Linda, thanks so much for a very thoughtful post. I asked about this very subject just a few days ago on #canningchat and @punkdomestics lead me to your post. From the info you have here it doesn’t seem we have much of a versatile selection. I’ve read much on the use of Tattlers and h’ve used Quattro in the past, I don’t like or trust either. And as you pointed out Weck is pricey. 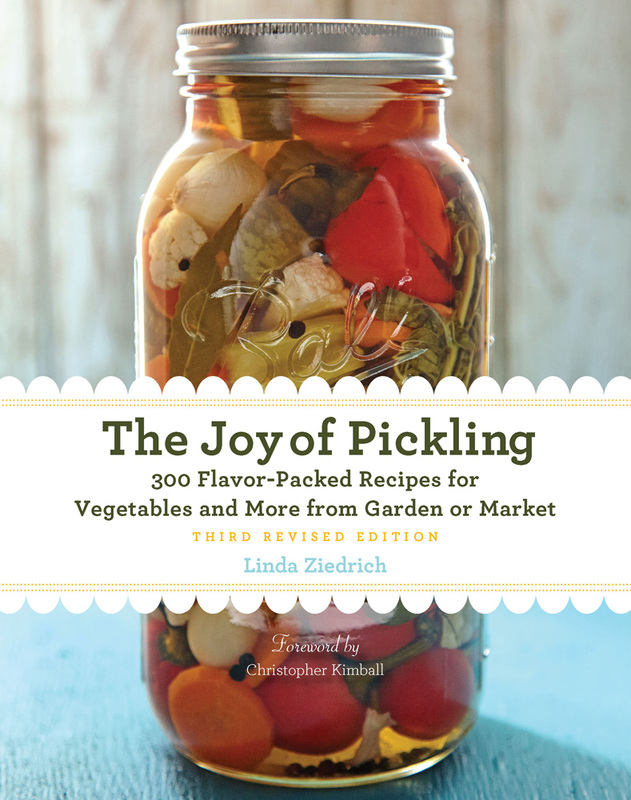 I do mainly water bath canning and lots of pickling and soft fruit spreads. This BPA has me concerned for I give the items my clients and family . Thanks again for a very informative post. Perhaps Ball and Kerr will address this issue in the near future. Mona, why don’t you like or trust Tattlers or Quattro Stagioni? Would you share your experience? I’ve never really thought about there being BPA in the lids. I guess we just have to do our homework when making any purchases that can have an impact on our lives or on the environment. I’m going to check out the Weck jars. They might be a little more expensive, but you only get what you pay for. And if you are thinking about ordering Quattro Stagioni for the upcoming canning season, Cathleen O’Keefe of the Massachusetts chapter of the Northeast Organic Farming Association (NOFA), is now doing the bulk order. I’ve only used Ball/Kerr for canning so far, but I found some of these Italian jars at an outlet store and they are sweet…can’t wait to try them for canning. Thanks for the link, Amara. I’m new-ish to canning (just some pears, applesauce and tomatoes the last few years) and have not worried too much about the BPA in the lids so far. My grandmother always used to use wax to seal the top of her jars, I believe she would use a regular Bernardin seal (we’re in Canada) with the wax beneath it… anyone have any experience using wax? Any idea why we don’t use it anymore? Sara, some people still seal their jam jars with paraffin wax, which is often sold along with modern canning supplies. A Wax seal can fail if the wax cracks or comes away from the glass, and you can’t check the seal as easily with wax as with a two-piece cap. But using wax along with a two-piece Bernardin cap ought to provide extra insurance against air penetration. would the wax protect against BPA leaching in to the food? I would expect so, yes. The wax would keep the jam from touching the lid if the jar is turned onto its side. I find it interesting that after years of saying, “we are only supposed to use the metal snap lids”, someone has come out and said, “the glass lids that we were told were dangerous are supposed to be safer.” So what you’re saying is my grandmother was smarter with her grade school education that all the food scientist who claim to know what they’re talking about. This is why home canning enthusiasts think food scientists have their heads stuck up their backsides. When you finally figure out what is supposed to be safe I’ll have long since died from something else, having eaten home canned food all my life. i am trying to find something…after dying mason jars are you able to use them for canning??? I don’t know, Kayla. How do you dye mason jars? Are you applying something that’s meant for staining glass? It shouldn’t affect the food if you apply it only to the outside of the jars, but you probably wouldn’t want the stuff dissolving or flaking into your boiling-water bath in any case. I would read the label to try to find out how durable the stuff is. Then you might boil a dyed jar with no food in it and see what happens. Hi there, I came across your blog whilst I was just researching BPA and lids as my friend and I have recently bought a pressure canner each and we’re looking to get our jars and lids. However, whilst we decide we had both resolved to use our Fowlers Vacola jars, the Australia water bath preserving system of lids and rings and clips. The rings are supposed to be replaced each use but I have reused them a few times without issue so far. You can also get standard lids r as I prefer, stainless steel lids which are BPA free. The FV jars are also apparently safe to use with pressure canning although I have not tested this. Although I know they are probably not available easily in the USA, it is another option. Thanks for this information, Little Hippy. Everyone, you can find clear pictures of Fowlers Vacola jars at http://everydayinthegarden.com/2012/03/14/bottled-tomatoes/ (scroll to the end of the post to see the stainless-steel lids and the clips). If anyone knows of a source for these jars (and lids and rings and clips) in the USA, would you please tell us? Interesting information Linda. I just bought a few ball jars tonight to make some homemade yogurt. The temp will never go above 115 F with the lids…so would that still be okay to use? Otherwise, they will be in the fridge. I also may freeze/refrigerate some nuts in them, as the ones I got are supposedly freezer safe. I don’t have much need to use them to do any canning…yet. I figured I would cross that bridge when i get there.Any help appreciated and good day to all!! Steve, Ball jars are quite safe for both yogurt making and freezing. For information of the manufacture of Jarden (Ball, Kerr, and Golden Harvest) jar lids, see http://diaryofatomato.com/2012/08/09/mastering-food-preservation-on-bpa-in-canning-lids/. You can keep liquid from leaking out of canning jars by allowing adequate headspace, keeping the water at a gentle rather than vigorous boil, and waiting a few minutes between turning off the heat and removing the jars from the canner. But I’ve never had leakage with jam, and I’ve never heard of water from a canner getting into a closed, unbroken jar. Has anyone else experienced this problem? As I had mentionned back in January, the Quattro Stagioni lids don’t allow venting and will unscrew under pressure from the contents of the jar. Now I use the jars with the Tattler lids and love the results. I have yet to butcher a native Quattro Stagioni lid to turn it into a classic Mason -type ring, since the ones I ordered along with the lids are sufficient for my normal use frequency. It is an experiment I’m curious to conduct, in case my few rings get damaged or I need more because I can several batches in a row. However, the Quattro Stagioni lids are wider than the cap alone, and loosely screwed over the cooled jar, they make stacking a breeze. Tattler delivers worldwide now, too. Keep those QS lids, you can’t really stack jars with the regular Tattler caps on them since they are neither flat nor as wide. Just half-screw them over the Tattler lid, just enough to keep them from rattling. Here in France the cheapest I can get them is in gift-pack presentation, and I have as many lids as jars, or even twice that for the one liter ones. Oh yes, one reason I haven’t tried yet to use an eviscerated QS lid as a ring is that I fear the sealing compound will clamp on the Tattler lid and take it along when I’ll unscrew the ring after cooling. I’ll have some canning to do tomorrow evening, I’ll try it with and without a ring of paper between the lid and “ring” to tell you how it goes. Otherwise you’re good for ordering some rings along with the Tattler. Thank you for the thorough information! I’d like to ask about the concern with recycled paper you mention in your second-to-last paragraph? Zahara, thanks for mentioning the concern with recycled paper, which I’d forgotten about since writing this post. BPA apparently gets into recycled paper when thermal paper is recycled along with non-thermal paper. The brief discussion of BPA in paper is out of date, however; as a Science News article (http://www.sciencenews.org/view/generic/id/341655/title/Science_%2B_the_Public__Whats_in_your_wallet%3F_Another_estrogen) points out, BPA has been largely replaced in paper with a similar chemical called BPS, which may prove to have the same estrogenic effects. And I will delete the mention of recycled paper, because in comparison with thermal paper recycled paper contains very little of either chemical. Has anyone tried to insert a piece of parchment paper between the jar and lid? I don’t do canning, but has been concerned about BPA when freezing foods using mason jar with a foodsaver. I successfully vacuumed and sealed a mason jar full of green tea. Maybe someone out there would try experimenting in canning this way? How do you propose to hold the paper in place? If you hold it with the lid, then it will be between the lid’s sealing compound* and the mouth of the jar to which it is suppose to attach itself. If you make it smaller, il won’t stay in place hovering under the lid, and the contents actually boil during the canning process and after being taken out. The paper would be soup. Few glues would withstand the heat of canning, not to mention being more harmful than the minute amounts of BPA in the lid coating. *I assumed you were refering to single-use lids only since the Tattler are already BPA-free. Since then I’ve only used the regular metal lids for canning and then used BPA free storage caps with special silicone seals to keep my goods fresh in the fridge. I was looking into purchasing canning jars today and stumbled upon a review for some that warned of the BPA content in most canning jar lids. Yikes! Here is an article explaining some alternatives to the traditional lid, and some ways to mitigate food’s exposure to BPA when using a traditional lid (like storing them upright). I’m not sure which route I am going to take as all the alternatives are fairly expensive. I may just have to use all the suggestions for reducing BPA exposure when using a traditional lid, it is a lot better than buying store bought canned goods! That’s very interesting, Judy. Maybe Jarden hasn’t advertised the change because old lids are still on the market. Or maybe Jarden is unsure of the safety of the substitute for BPA? I look forward to learning more. “Is it possible to sterilize preserves in the oven? I still love using the jars themselves with Tattler lids, and would recommend them to anyone who can’t have access to regular Mason jars at a cheaper price. Thanks for that information, Tasuki. Anyone wanting to confirm that Quattro Stagioni one-piece caps should not be used for pressure canning can check this page: http://myhome.bormioliroccocasa.com/myhome/en/home/catalog/quattro-stagioni/Tips/questions-answers.html. It is the second-from-top answer. Can You confirm me that Quattrostagioni lids can be used on Mason jars and viceversa? 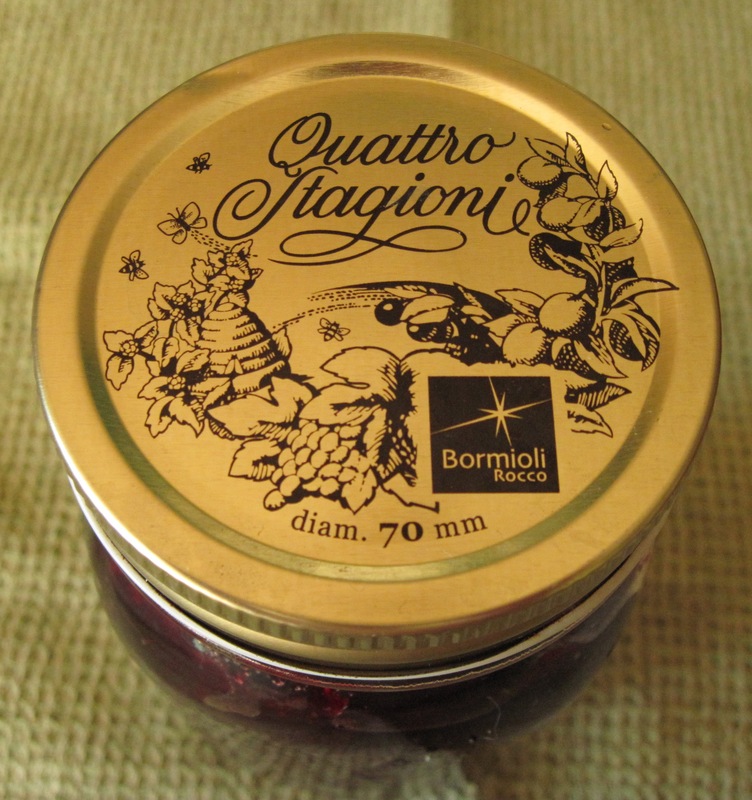 I would like to buy Mason or Tattler lids to use on my Quattrostagioni jars. Andrea, thanks for this good question. Mason is not a brand name, but you can definitely use Quattro Stagioni lids on Ball and Kerr jars. I don’t have any Quattro Stagioni jars, but I’ve read that you can use Ball or Kerr lids on the 500 ml (approximately 1 pint) Quattro Stagioni jars, but not on the 250 ml (approximately 1/2 pint) jars. If this is wrong, I hope someone will correct me. Bottles (1 litre) and 150 ml jars require dedicated 56 mm lids made only for Quattro Stagioni jars. I use Tattlers with the 500ml, 300 ml, and 1 litre jars. The few one-use metal lids I’ve tried worked fine too. You’ll need the Mason screw bands, though. Thanks very much for that information, Tasuki. Hi Tasuki, not sure if you are still tracking this… I know that Quattro Staggioni lids are not okay for pressure canning… but what about the bottles themelves, do you have any information from the manufacturer about whether they certifiy the Quattro Staggioni bottles for pressure canning? Thanks very much for that information, Lisa. Just a note of caution about the Tattler lids, PLEASE read their warnings on their website and follow directions closely INCLUDING putting a towel over the lids when screwing them down. The directions to use a towel are NOT on the box and my husband (a 30 year canning veteran) had a jar blow up in his face (the seal blew while it was still very hot) and he has 2nd degree burns. And this is not the only case of being burned I’ve heard of with Tattlers. MANY people are having less than good results with the sealing of these lids, and there are questions about the safety of the plastic if used over 250 degrees. From what I’ve read on various Internet places, I’m under the impression that the main issue people have is making the transition from metal disposable lids. 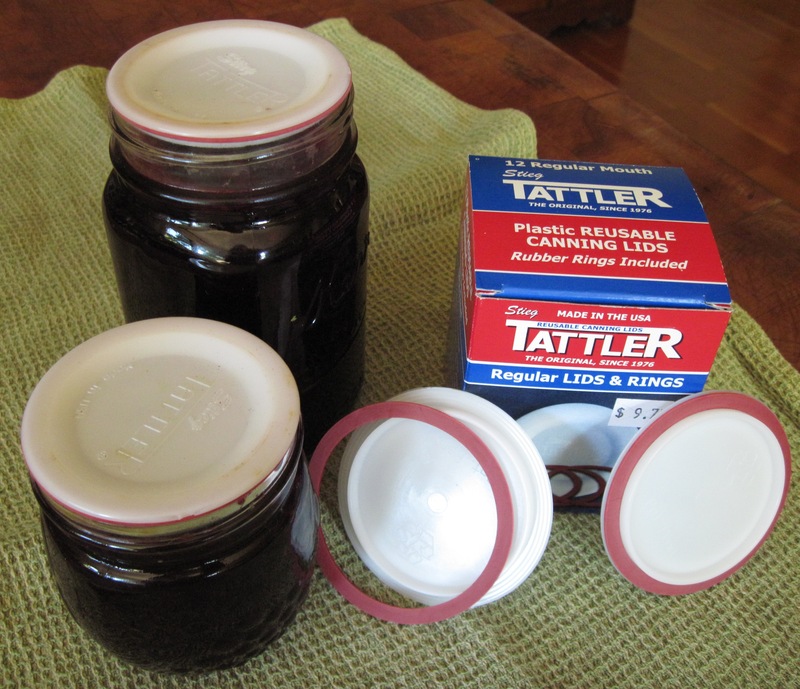 I started directly with the Tattler ones, and have had only two seal failures in over 150 jars. I did experience this kind of blow-up once, with a re-used commercial jar ans its twist-off lid. As it tuns out, it was screwed on too tightly and the extra pressure on the lid when i attempted to screw it dowb completely when taking it out of the canner was that proverbial straw, causing the jar to erupt and chicken stock to redecorate my kitchen. It did happen too that my Tattler lids came out domed, and that was one of my seal failures. I must have screwed them too tighly, which hampered the venting process. It is probably much more difficult to unlearn a 30-years-settled successful habit and replace it by another one that sems very similar. Once gain, those I know who started with the Tattler lids do not seem to have these issues. It’s good to discuss with others to find out what the problem is, and it’s great to see so many canners out there and to know people are still learning the art! have you found out what is in the food grade resin bernardin claims to be using instead of the bpa in their mason jar lids? I can’t get an answer from them. I don’t know for sure, Carolyn, but I would bet that the coating on Bernardin lids is the same as the coating on Ball and Kerr lids, since all of these labels belong to one company, Jarden. And Jarden is keeping the constituents secret. I’ve been thinking about this issue for a long time, and I’m slowly starting to get rid of all plastic that comes in contact with my food (which is nearly impossible, so I’m just trying to limit it for now). I love mason jars, especially since they’ve been around for so long, and you can find them anywhere (garage sales, the grocery store)… but I really don’t want any kind of plastic, BPA free or not, to come in contact with my food if possible. I’ve been working with beeswax a lot lately to create different alternatives for plastic and plastic by-product kitchen products (like plastic wrap and oil finishes for wooden cutting boards), and I was thinking: what if one were to melt a small amount of beeswax onto a mason jar lid? That way, the plastic would be covered (or I could figure out a way to take off the plastic completely), but there would still be a nice finish to seal the jar. I think I might be on to something with this. HI, I know this is an older article, and I did not read all the comments, so this may have been covered. Regarding Bisphenol A, although a company making foods/containers/lids etc may advertise their products as being BPA free, know that many companies simply reformulated the BPA to BPS, which is unregulated, not advertised, and potentially more toxic than BPA. Thank you! We haven’t discussed BPS here yet. Here’s a Wikipedia article about it, and here’s an article about BPS in paper products. The primary source of BPS in human urine is not mason jar lids but cash-register receipts. Oh how interesting…thanks for the links.